Wynaut in game: 4,483 Who? Important notice! Pokemon Wynaut is a fictional character of humans. Wynaut (Japanese: ソーナノ Sohnano) is a Psychic-type baby Pokémon introduced in Generation III. It evolves into Wobbuffet starting at level 15. Wynaut is a small, bipedal Pokémon covered in blue fur. Its head is spherical with ear-like, fingerless arms on either side and a bulbous growth on its forehead. It has a wide mouth with a serrated upper jaw and a pink tongue. Its eyes appear closed, each curving upward to a point in the center. The fur on its body ends in a zigzag pattern, extending over its short legs. 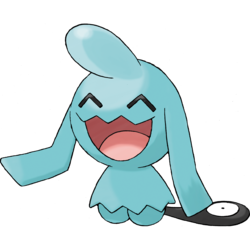 Wynaut's tail is long and completely black, ending in a round, flattened tip with a white, eye-like spot. Wynaut tends to live in caves and travel in herds. It will test its endurance by squeezing up against other Wynaut at night. In doing so, it strengthens itself, toughens its spirit, and learns to deal powerful counterattacks. When angered, it will slap the ground with its tail. As it loves to eat sweet fruit, it is also drawn to fruit gardens. Wynaut first appeared during the Blackthorn City arc (Fangs for Nothin' - Why? Wynaut! ), but Jessie's Wobbuffet, Ash's Bayleef and Ash's Noctowl were the only ones to see it. A Wynaut also appeared in Camp Pikachu. This Bright Pokémon helped Pikachu and co. help the Pichu Brothers get to the next train to Big Town. At the end of the episode, the same Wynaut called several other Wynaut, apparently its friends, to help the gang move a cart in order to reach the train. In Who, What, When, Where, Wynaut?, a plan of Team Rocket's backfired and sent everyone to Mirage Island. The only inhabitants of this island were none other than Wynaut. A Wynaut was seen among other baby Pokémon in The Brockster Is In!, and, like the others, was nursed back to health by Brock's newly evolved Chansey. Three Wynaut appeared in A Fork in the Road! A Parting of the Ways! under ownership of Dr. White. A Wynaut appeared in Alexa's magazine in The Journalist from Another Region!. 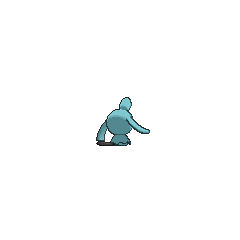 A Wynaut appeared in Cloudy Fate, Bright Future!, under the ownership of a Psychic. AG113 Wynaut May's Pokédex Wynaut, the Bright Pokémon. Wynaut are the pre-evolved form of Wobbuffet. They travel in herds and at night, and retire to caves where they sleep together in groups. A Wynaut first made a cameo as one of the many Trainer-owned Pokémon who were transported to stop Ho-Oh and Lugia's rampage in The Last Battle XIII. Later, many wild Wynaut made an appearance on Mirage Island, where Ruby and Sapphire trained for the upcoming battle against Maxie and Archie. Pokémon Mystery Dungeon: Red Rescue Team and Blue Rescue Team: Wobbuffet and Wynaut send the player on a mission into the Uproar Forest. As thanks for completing it, they help to remodel the rescue base. Wynaut also makes an appearance discussing the identity of the strongest Pokémon with Lombre and Bellsprout in the cutscene that unlocks the Western Cave. Pokémon Mystery Dungeon: Explorers of Sky: A different Wobbuffet and Wynaut duo appear in Explorers of Sky, first seen examining a rock outside of Treasure Town. Several days later, the two are seen standing outside an entrance where the rock once was, and usher the player and partner into what is revealed to be Spinda's Café, where the pair manage the Recycle Shop. Later in the game, Wynaut informs the player of any new areas discovered after the introduction of Spinda's Project P.
Wynaut can always be seen with a big, happy smile on its face. Look at its tail to determine if it is angry. When angered, this Pokémon will be slapping the ground with its tail. Wynaut gather on moonlit nights to play by squeezing up against each other. By being squeezed, this Pokémon gains endurance and is trained to dole out powerful counterattacks. A Wynaut loves to eat sweet fruits. It cleverly picks fruits using its earlike arms. They gather in fruit gardens, drawn by the fragrance. It tends to move in a pack with others. They cluster in a tight group to sleep in a cave. It grows stronger by pushing up against others en masse. It loves eating sweet fruit. It tends to move in a pack. Individuals squash against one another to toughen their spirits. It grows strong by pushing up against others en masse. It loves eating sweet fruit. Moves marked with a superscript game abbreviation can only be bred onto Wynaut in that game. 51%-100% HP Wynaut likes to be with friends! 26%-50% HP Wynaut has only half HP left. Level up Wynaut leveled up! Wynaut went to an island in the Beach Zone looking for Berries. But the bridge broke and he got stuck. You helped him by building a bridge. Everyone in the Tech Area cares for Wynaut. He is a good friend of Kirlia. Occasionally erases one of the foe's disruptions on the board. 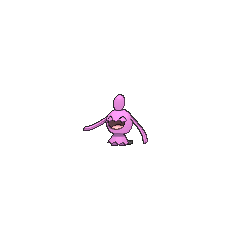 For other sprites and images, please see Wynaut images on the Bulbagarden Archives. In Generation III, Wynaut is the only baby Pokémon found in the wild in the games, on Mirage Island. Oddly, in Generation IV, Wynaut is the only baby Pokémon that cannot be found in the wild. Wynaut is one of the few Generation III Pokémon who made a debut before the Advanced Generation series. 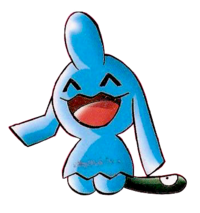 Like its evolution, Wobbuffet, Wynaut is probably based on an Okiagari-koboshi doll, a Japanese traditional doll with squinted eyes that stands back upright when pushed over. It is a symbol of perseverance. Wynaut is a play on the phrase, "Why not?" Sohnano is nearly homophonous with the phrase そうなの sō na no, which means, "Really?" or "Is that so?" with only a difference in tone. 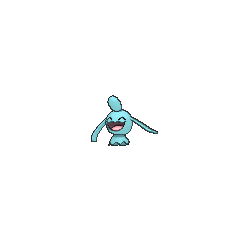 It is played off by its evolution, Wobbuffet, whose Japanese name of Sonans is homophonous with the interjection そうなんす sō na-n-su, which roughly means, "That's the way it is." Together, they make for a potential perpetual conversation of, "Really?" followed by, "That's the way it is," and so on, as seen in Camp Pikachu. Other languages' names for the Pokémon in this family, due to the fact that they were introduced in different generations, do not feature this pun. German Isso From "Ist es so?" Korean 마자 Maza* From 맞아요 majayo; 맞아 is less polite than 맞아요.